When we talk about the true big daddies on the SUV scene, the is near the top of our list. Toyota sold more than a million of the quintessential two-door wagons known as the FJ40 worldwide beginning in 1960, and more than 300,000 Land Cruisers have found U.S. buyers since. Many FJ40s still see abusive service in the roughest parts of the world, even though Toyota hasn’t built them since 1983. In less than a year, a newly distinctive offspring of that iconic FJ40 will start appearing on-and off-roads around the country. 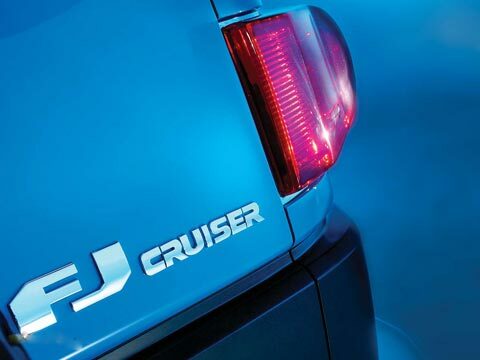 It will be called the FJ Cruiser so that Toyota still can offer the slow-selling flagship Land Cruiser, which has strayed far from the Jeep-like FJ40 Land Cruiser in its hugeness and plushness. 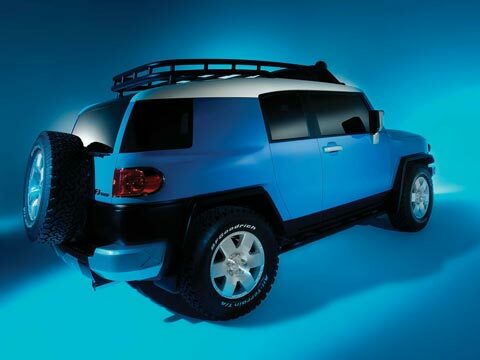 Based on 4Runner underpinnings, the production FJ Cruiser is remarkably unchanged from the well-received and highly cartoonish concept that debuted at the 2003 Detroit auto show. Toyota revealed the exterior prototype of the production vehicle at this year’s Chicago show in February, hailing it as a return to the roots of SUVs. Four-wheel-drive FJ Cruisers should be quite solid off-road; rear-wheel drive will be standard. While it measures eleven inches shorter than a 4Runner, its wheelbase is shortened by only four inches, which should result in good departure and approach angles. An available locking rear differential and the standard 4.0-liter V-6, rated at 245 hp and 282 lb-ft of torque, also will aid in rock-crawling adventures. That V-6 shares its four-liter displacement with two other small SUVs that Lentz notes as likely competitors to the FJ: the , which shares exterior dimensions very close to the FJ’s, and the Rubicon. The Xterra‘s V-6 has an advantage of 20 hp and 2 lb-ft, while the Rubicon’s ancient straight six gives up 55 hp and 47 lb-ft to the Toyota. The original FJ40, a smidge smaller and taller than a modern-day base Wrangler, never got more than 135 hp and 210 lb-ft out of its inline six. The FJ’s wacky appearance is definitely more arresting than its competitors’. Deliberate styling cues from the first-generation Land Cruiser include round headlights with an integrated grille, the upright windshield, the white-cap roof, and wraparound rear glass. An unlikely childhood friend of senior creative designer Jin Won Kim also influenced the FJ’s development. “I had a pit bull when I was growing up,” says Kim. “I’ve been inspired by the stance of the pit bull when it’s about to attack-it’s got that forward-leaning gesture and a really strong stance.” It’s also a novel refutation to the suggestion that Toyota is merely jumping on the recent retro-styling bandwagon. Will the active-lifestyle Generation Y target audience be able to afford the FJ? Toyota vaguely claims it will be a “surprising value.” We can ascertain only that it will be priced between the RAV4 and the 4Runner, so expect it to cost $25,000 to $30,000. 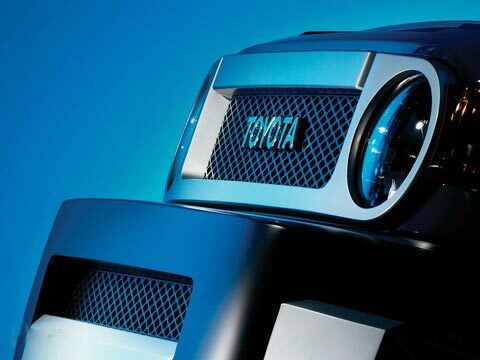 The FJ will get loads of standard equipment, including some things that would have seemed Jetsonian on the original FJ40, such as a CD player, air-conditioning, power windows and locks, and-as with the rest of the Toyota SUV lineup-stability and traction control, ABS, electronic brake-force distribution, and brake assist. Optional front-side and front and rear side curtain air bags add to the safety factor. Plentiful Scion-like accessories also will tempt the projected 40,000 FJ customers. Unfortunately for open-air enthusiasts, Toyota has no current plans to give the new FJ removable roof sections like those on the original FJ40. Likewise, Toyota does not anticipate offering the FJ in four-door or hybrid form. Our only real disappointment with this vehicle is its name, reminiscent of Chrysler‘s worn-out PT Cruiser. We reckon Toyota should steal the Land Cruiser name from its upscale SUV and slap it on the side of this FJ, which stays truer to its paternal roots.